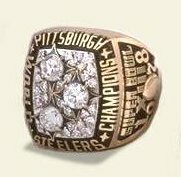 To commemorate their at-the-time unprecedented third Super Bowl victory (and second over Dallas), the Steelers integrated their logo into the ring by using the three hyporcycloids (star-shapes) as settings for three half-carat diamonds. Surrounding these diamonds is a field of 30 smaller diamonds, making a total of almost three carats per ring. One shank features the Super Bowl XIII logotype above a representation of the Vince Lombardi Trophy rising out of the Orange Bowl (site of the game) and the Miami skyline. The game's score, 35-31, is also incised on the shank. The other shank is personalized for each player, including a unique three-quarter view of his helmet. The yellow gold ring weighs 28 pennyweight and was designed by Josten's.